This week’s ONE DEEP TOPIC: The Harvey Weinstein scandal. ET News/Pop Culture Topics include: Star Wars: The Last Jedi trailer, the possible returns of ‘Supermarket Sweep’ & ‘Name That Tune’, Eminem and more. Find our featured ‘Pod Friend of the Week’ Netflix N’ Swill on Twitter @NetflixNSwill or on PodBean HERE. Please consider being a Patron of our show by visiting us on our Patreon page. Much love & thanks. 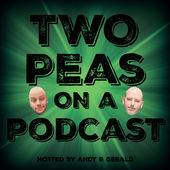 Follow us on Twitter @TwoPeasOnAPod and visit us online at TwoPeasOnAPod.Com. Like us on Facebook, and also consider joining our Facebook Fan Community. E-Mail us feedback, questions or topic ideas anytime! A very special thanks to Emily Prokop from The Story Behind Podcast for providing the voice-over for our ‘Pea Break’ intro. “The Real Slim Shady” by Eminem. 2000 Aftermath. All Rights Reserved. “Flagpole Sitta” by Harvey Danger. 1997 Slash Records. All Rights Reserved.